Contrast: darkness and brightness, void and fullness, young and old, close and distant. The dark nebula identified as Barnard 86 is located in Sagittarius was discovered by Edward Emerson Barnard in 1919. Even the name of the nebula is originating from Barnard, because he described it as "a drop of ink on the luminous sky". As it can be observed in the picture: this region of the sky is full of stars, every single bright dot in the picture is a star, there is one for almost each pixels of the image. The star field is so dense, that it can easily be spotted by the naked eye from a dark site far from light pollution. It appears as a bright diffuse patch in the sky, because unaided eye does not have the resolution to be able to detect individual stars in it. The patch is part of the bright strip in the sky people have known as the Milky Way since the ancient Greeks. The area shown in the picture is in one of the brightest regions of Milky Way. Combined light of the stars appearing tiny in the picture is so bright that objects can cast shadow in it, and that shadow can be observed by the naked eye under very dark skies, especially on the southern hemisphere, where Sagittarius transits high above the horizon. Barnard 86 is a dense cloud of interstellar dust and gas, much denser than its neighbourhood. 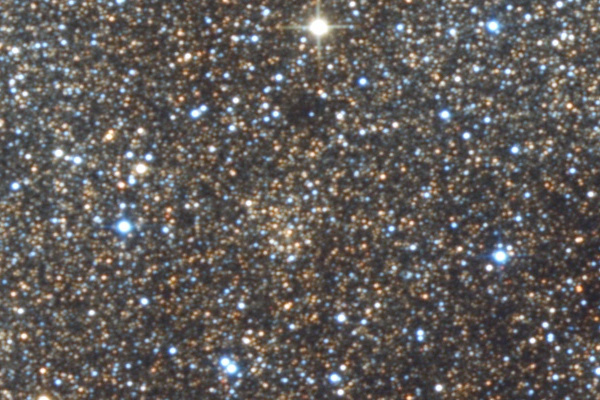 It is dense enough to absorb light coming from stars behind, thus the area looking dark and void in the centre of the picture is not void at all. Even the variable thickness of the cloud can be observed: it is thinner at the edges, thus some stars can shine through the those regions, but as the cloud gets thicker towards its centre, the number of visible stars is dropping too. There are a couple of bright stars appearing in the dark patch, actually they are not in the nebula but in front of it, so the light of those stars can reach us unaffected. Compact and dense interstellar clouds, like Barnard 86 are also called Bok globules, and often new stars are being formed inside them. Very likely it is the case with Barnard 86 as well, and a new generation of stars are being born from the dense cloud. Next to the right hand side of Ink Spot nebula a couple of bright blue stars can be observed, members of the open cluster called NGC 6520. The age of them are estimated about 60-150 million years, which is very young in astronomical terms (the age of our Sun is 4.6 billion years). Since both the cluster and the nebula are in the same distance from us, about 6-7000 light-years, suggesting that the stars of the cluster were formed of the same molecular cloud which the Ink Spot nebula is a remainder of. As a contrast to the young open cluster, there is something old in the picture too, an ancient globular cluster called Djorgovski 2. It appears in the centre of a trapezium formed by 4 bight stars in the picture, left to the image centre. With two similar ones, the distant globular cluster hiding behind the dense field of stars was discovered by Stanislav George Djorgovski American astrophysicist while he was looking for globular clusters in data recorded by IRAS infrared space-telescope. He succeeded. Globular clusters, in opposite to open clusters, consist of a large group of old stars forming a spherical shape. Djorgovski's globular clusters, just like globular clusters generally, are located in the halo of their galaxy. 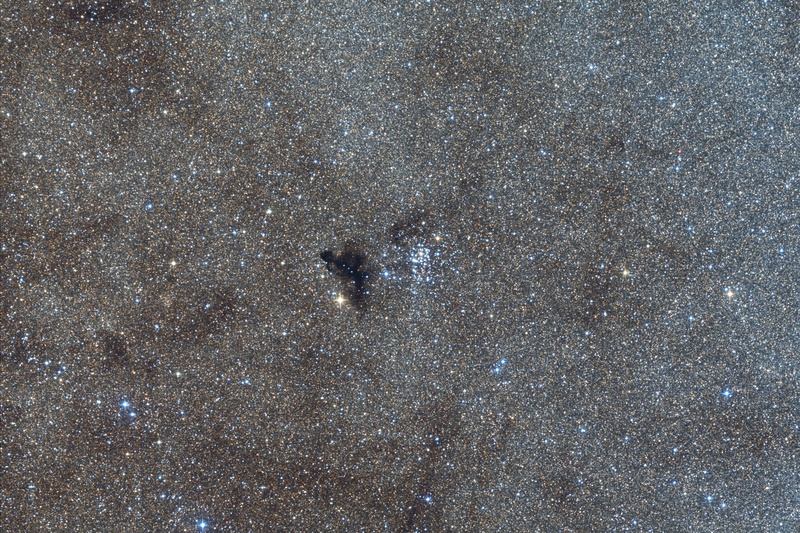 Djorgovski 2 is much farther from us than Barnard 86 and NGC 6520, actually even much farther than the rest of the stars filling the image evenly. Its distance is about 2000 light-years.